If you you follow me on my Instagram, you will know that I am a HUGE fan of stripes. Today's outfit is the epitome of my casual outfits. Cool, casual, relaxed, yet put together. I wore a pair of distressed boyfriend jeans with a striped nautical T-shirt. I think the contrast between the rugged boyfriend jeans and the refined stripes is great! To break up the monotony of the blue denim and blue of the T-shirt, I added a camel colored leather belt. Camel is a great neutral color that works with almost anything and it is also super versatile! To complete the outfit, I cuffed the jeans and added a pair of navy colored leather boat shoes. What do you think of my ensemble? I've been away from this blog for so long, but I've decided to start blogging again and on a more regular basis. I will be posting everything from my outfits to shopping trips to reviews to food!! To end my hiatus, here is a simple outfit post from today. 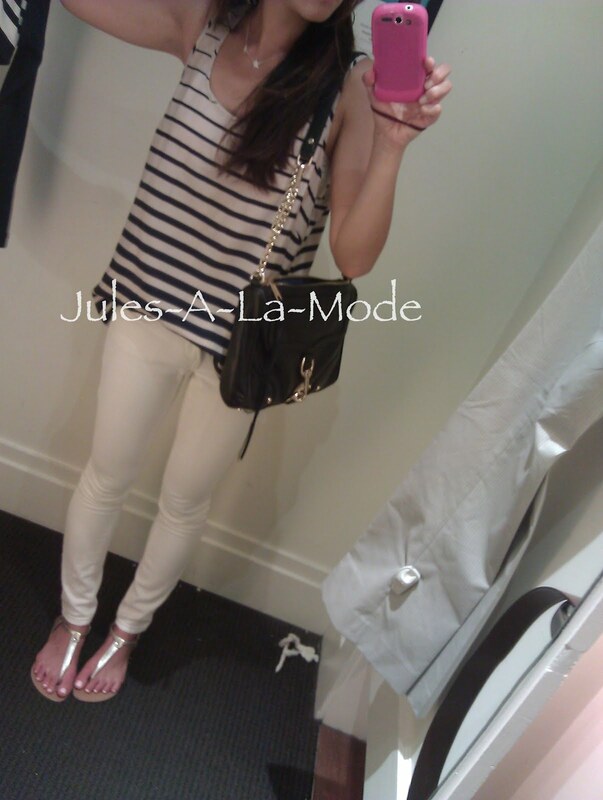 I paired white denim with a flowy silk striped tank. I love the juxtaposition of the soft silk with the bold stripes. The change in thickness of the stripes adds a modern twist to the classic nautical stripe trend. As for accessories, I wore my favorite summer bag, the Rebecca Minkoff Mac Bombe clutch. Forgive the quality of the photo. I took this using my phone sans flash in the fitting room or Banana Republic! I would love your support and comments/suggestions for this blog! Here is an outfit that is simple, trendy, and comfortable. This outfit is the epitome of my style. I practically live in leggings/jeggings in the winter. They are comfortable, stylish and practically goes with anything. These are a pair of faux leather leggings I purchased from H&M for only ~$20! What a bargain. I love love large oversize sweaters that flow. It drapes so nicely and makes the entire look effortless. You can take this outfit from day to night by changing your shoes. I wore these to work with a pair of flats and changed to these ankle boots go to dinner with friends. Are you a fan of leather leggings? Here is my ootd featuring my newest purse of my handbag collection. It's the Hamilton by Michael Kors in the colors Luggage. I think it's such a super versatile purse because the colors and shape is so classic yet feminine. I love combining trendy and classic pieces. I'm wearing a BCBG bandage skirt that is extremely flattering on almost all body types. I decided to pair this with an oversized crop top from H&M. To add a little edginess to the outfit, I decided to pair a pair of black suede booties. These booties are super tall, but the 1.5 inch platform makes them easy to walk in. It's such a versatile boot. I love it! And finally, I paired this entire outfit with a classic quilted black and gold chain purse. Whenever I'm clueless about what to wear, I always throw a black and white outfit together because you can never go wrong with that color combo! It's so timeless and classic. It's put together yet effortless. I paired my J Brand skinny jeans with a white over-sized flowy top with gold detailing at the pocket. I think shirts like this are great for transition weather (spring to summer) because it's thin, but still warm enough to keep you warm. Spring is here, but it's definitely still chilly. I wore J brand black jeggings and a nautical inspired Forever21 top. I topped it off with a navy school boy blazer from Gap and a quilted turn-lock black purse.